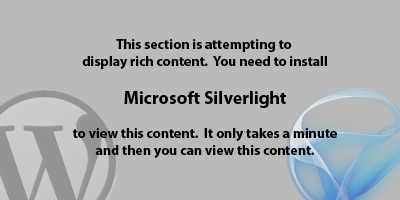 This is a test of the Silverlight Plugin for WordPress by Tim Heuer. Move your mouse over the Silverlight control to start additional animation. Documentation was a bit light on the ground but a Google cached copy of Heuer’s blog page revealed the required parameters. The trick is to place your Silverlight component’s XAP file into the root of your blog website (it was not specified, but we figured out this by watching the http requests with the Firefox Http Headers adding).